In long lost ancient computer history there was a device called a MODEM. This took computer data signals and turned it into traffic that the phone lines could understand. MODEM actually stood for MODulator-DEModulator which is exactly what it did. Now, in wireless you still need Modulation to control the signal as it is transferred to the radio (yes, wireless uses a radio to transmit data). The Modulation Coding Scheme is what is now used to describe this. The MCS represents the way a wireless device takes the carrier signal and combines it with the data stream to be sent. 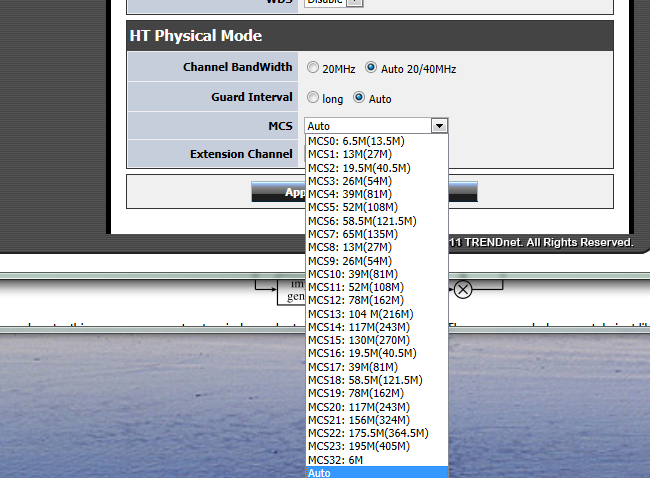 The MCS index is based on a number of factors, including the modulation type (Digital type, not analog), the channel used, signal strength and noise (also called interference), plus the number of MIMO antenna is use. As you can see, this gives you a very wide variance of possible speeds. For example let’s take a look at just the three antenna range. At the very bottom of the list is the BPSK (Binary phase-shifting Key) type of modulation. This is a very inefficient modulation type that only uses two phases to modulate the data (which is indicated by the Coding rate of ½) on the 20MHz channel with an 800ns (nano-second) Guard Interval (Guard Interval is a delay that which allows the wireless device to accommodate for echo, reflection and signal overlap) you are only going to get 19Mbps. This would be exhibited on a channel with a lot of noise and with a very poor signal quality. These types of situations are happening more and more in residential areas as just about every house has a wireless device (in my area there are 24 wireless access points that I can see from my office). Before we move on, let’s take a quick stop and talk a little about guard interval. You have probably noticed there are two options for the narrow band (20MHz) and the wide band (40MHz). The 800ns option is the default and gives you the best data integrity. 400ns was only added later to push the transmission speeds higher, but has the distinct possibility of data loss and inconsistency. This is even more true in a very busy or noisy environment (like a typical apartment or neighborhood). In most cases switching to 400ns will only cause frustration as you can lose data packets and connectivity if there is crosstalk between wireless devices. Back to modulation though: as we move up through our standards we come to the more robust QPSK (Quadrature phase-shift keying), as the name implies this bumps things up from two distinct phases to four for modulation and gives a healthy speed boost. This is the most common modulation used when you have a noisy channel or environment. Your speeds can range from 39Mbps to 90Mbps if you are brave enough to use a 400ns Guard Interval. However, considering the fact that if your device has dropped down to this you are having transmission issues and it is unlikely you will be using anything other than the 800ns GI. Next up on the plate is QAM (Quadrature Amplitude Modulation). So named because it is capable of sending two analog and two digital streams at the same time (for a total of four). There are two flavors of QAM in wireless at this time: 16-QAM and 64-QAM. The number represents the number of points in the transmission grid (which we will not go into here, but basically represents the amount of data sent), the higher the number, the more data can be sent. 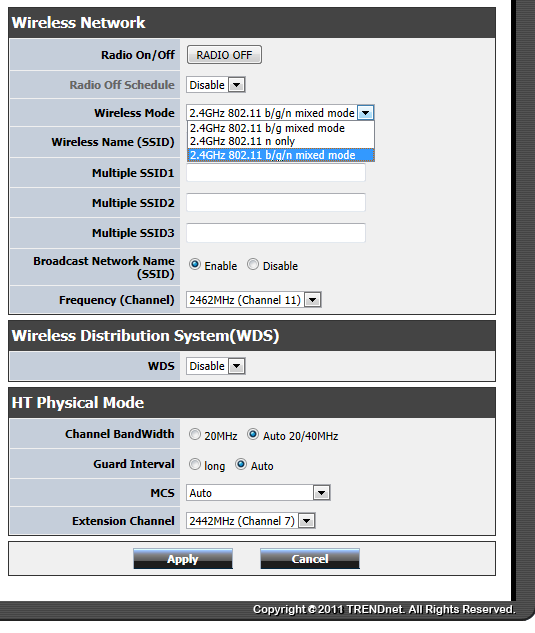 Now here comes the problem with this… There are two issues with using QAM in wireless. Because the “points” used in transmission are not all on the same amplitude (or not all on the same wavelength to put it VERY simply) the processor now has to find not only the phase that the point is on, but also the amplitude to correctly demodulate the signal for processing. The practical upshot of 16 or 64-QAM is that you have to have a very clean and strong signal to use them. If not you are kicking back down to QPSK and your average of 58-121Mbps speeds (At an 800ns GI). This is the reason why some systems will never, ever get close to the stated maximum of 300Mbps, or now 450Mbps. So what do we have here? We now know that no matter the stated speed on the box there are simply too many variables to guarantee that speed. Now let’s add something else for you think about: the average laptop 802.11n card only has two antennas. This means that you have to calculate the max speed using the two spatial stream table and we have not even gotten into the impact that wireless encryption, distance and signal degradation has on all of this. In short, the average test of wireless hardware is just plain wrong. To properly test, you have to know that the MCS the access point is using has an open channel to use and make sure both your wireless card and access point have the maximum spatial streams for the speed they claim. You also need to isolate the specification you are using (n most of the time). At that point you can form a baseline for performance and work back from there moving through each level of antenna, MCS, and if possible modulation type and Guard Interval on both narrow and wide bands. We hope this has not added to the confusion over wireless, but if it has feel free to shoot us a line and we will try to clarify. In our next article we will cover wireless encryption and its pros and cons.